The publicly funded gvSIG project is a free and open source Geoinformation System (GIS), that enables users to interactively visualize, manage, modify and analyze spatial information in the form of digital maps, images and database tables. It is easy to learn, yet versatile and efficient enough for demanding GIS tasks. Above all, it is freely available, at no charge and under a license that emphasizes your freedom of use rather than restrictions. It is also a cross-platform application, based on Oracle's Java technology, which currently runs on Windows (2000/XP/Vista/7), Linux and Mac OS X operating systems, giving you great flexibility in its deployment. At Oxford Archaeology, we believe that gvSIG has matured into a powerful application that can be used productively in many working environments, especially when used in combination with other open source solutions such as GRASS GIS. 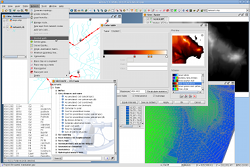 We have used the software in a number of our own projects and made a number of modifications to it that we feel could also benefit other users of gvSIG; including a restructuring of the program menus, an easier installer that includes everything needed in one package and integrated GRASS GIS modules. This edition is based on gvSIG 1.10 It is provided "as-is". Get gvSIG OA Digitial Edition here!